NEW YORK -- Ismaaiyl Brinsley, the man who ambushed and killed two NYPD cops in Brooklyn Saturday, began his day by shooting his ex-girlfriend and making online posts that were "very anti-police," Police Commissioner Bill Bratton said. Baltimore County Police responded to a call at Brinsley's ex-girlfriend's home in the Baltimore suburb of Owings Mills, Maryland around 5:48 a.m. on Saturday. Brinsley had shot the 29-year-old woman in the stomach and fled, cops said. She's expected to survive. Police in Baltimore then discovered around 1:30 p.m. that Brinsley had been making posts from the woman's Instagram account that threatened to kill New York officers. They determined the posts were being made from Brooklyn, New York. A short time later, around 2:30 p.m., police in Baltimore called the 70th precinct in New York, advising NYPD that the phone of a suspect in the Owings Mills shooting is pinging in their Brooklyn precinct. The two police departments discussed the Instagram posts during the call, and a "wanted" poster of Brinsley is faxed to NYPD with information about the subject. A little more than 15 minutes later, Brinsley approached the passenger window of a marked police car in the Bedford-Stuyvesant section of Brooklyn. The officers were on special patrol doing crime reduction work at the corner of Myrtle Avenue and Tompkins Avenue in Bedford-Stuyvesant. Brinsley approached people on the street moments before opening fire and asked them to follow him online on Instagram, then told them to "watch what I'm going to do," Chief of Detectives Robert Boyce said. He then shot Officers Rafael Ramos and Wenjian Liu in the head, killing them. He took off running. Boyce said a pair of Con-Ed city workers spotted him running and tailed him in their vehicle while calling police. Officers the pursued him down to a nearby subway station, where he shot himself in the head as a subway train door full of people closed. Then, around 2:50 p.m., The Baltimore Police Department sent a teletype with the same information contained on the "wanted" poster to the NYPD's real-crime center at police headquarters. 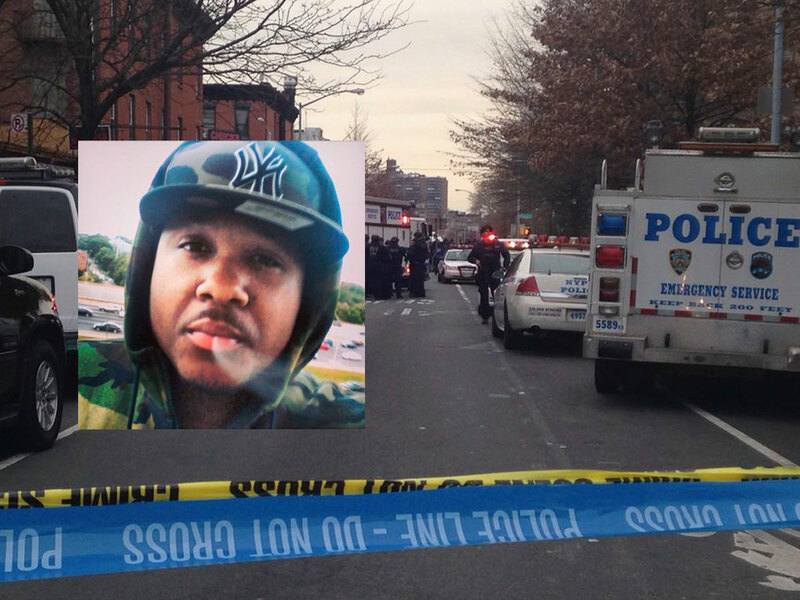 Bratton said Saturday that the NYPD first learned about Brinsley's connection to Brooklyn via a faxed warning flier, but it was not received until around the same time as the 2:47 p.m. shooting. "At approximately 2:45 this afternoon, Baltimore authorities sent a fax," Bratton said. "Unfortunately, it was essentially at the same time our officers were being ambushed and murdered by Brinsley." Brinsley, 28, had at least 19 arrests in Georgia and Ohio and a troubled childhood so violent his mother was afraid of him, police said. Brinsley had also ranted online about police and government and expressed despair about his own life, Boyce said. Boyce said Brinsley's mother believed he had undiagnosed mental problems and may have been on medication later in life but detective said they were still trying to determine if he had a mental illness. Brinsley wrote on an Instagram account ahead of the shooting: "I'm putting wings on pigs today. They take 1 of ours, let's take 2 of theirs." "This may be my final post," Brinsley wrote in the Instagram post that included an image of a silver handgun. A silver handgun was recovered at the scene of the shooting, police said. Another picture showed what appeared to be blood on a pair of jeans and references to Brooklyn, CBS New York reports. CBS News could not independently verify that the messages came from the suspect. Bratton confirmed that Brinsley made very serious "anti-cop" statements online but did not get into specifics of the posts. He said they were looking at whether the suspect had attended any rallies or demonstrations. The posts were apparently online for hours, though it's not clear if anyone reported them. Lindsey Graham on NYPD deaths: "I blame the shooter and nobody else"
Bratton called on New Yorkers to alert authorities of any threats to police they see - even if they do not seem real. "That information must get into the hands of the police officers," he said. Bratton said the department's 35,000 officers will soon be getting new technology that would allow the immediate sending of photos and warnings into the field, CBS New York reports. Hours after the shooting, the head of New York City's police union blasted Mayor Bill de Blasio and those who have recently protested against incidents of police violence. "There's blood on many hands tonight," Patrolmen's Benevolent Association President Patrick Lynch told reporters outside the hospital where officers Liu, 32, and Ramos, 40, died. "Those that incited violence on the streets under the guise of protest that tried to tear down what New York City police officers did every day. We tried to warn it must not go on, it cannot be tolerated," Lynch said. "That blood on the hands starts at City Hall in the office of the mayor." Lynch and de Blasio have been locked in a public battle over treatment of officers following the decision not to indict an NYPD officer in the chokehold death of Eric Garner in July. Just days ago, Lynch suggested police officers sign a petition that demanded the mayor not attend their funerals should they die on the job. NAACP chief: Murder of NYPD officers shows U.S. "violence problem"
Demonstrators around the country have staged die-ins and other protests since a grand jury decided Dec. 3 not to indict the officer involved in Garner's death, a decision that closely followed a Missouri grand jury's decision not to indict a white officer in the fatal shooting of Michael Brown, an unarmed black 18-year-old. Rev. Al Sharpton, who has led marches against police brutality across the country in recent months, said in a statement: "We have stressed at every rally and march that anyone engaged in any violence is an enemy to the pursuit of justice for Eric Garner and Michael Brown." Several New York officers were assaulted during a demonstration that drew thousands to the Brooklyn Bridge last weekend, although the protests have been largely been peaceful. Three people have been arrested in the assault; four other suspects remain at large.